Last weekend we went live with Drew from Fire Reviews. If you don't follow him yet you should. He'll get you in the loop on the best fire products and companies. We talked for an hour, then cut it down to the best 30 min. to share with anyone who missed it. Here's the Q&A portion of the talk. Enjoy and if you have any questions you want answered reach out on Instagram or Facebook. P.S. Drew includes his discount code for the Firefighter Interview Training Course at the end of the video. Every minute you put into perfecting your interview is necessary and worth it. In our last post we addressed why these myths aren’t true now, let’s talk about what to do instead. MYTH #1: Its best to memorize your answers to common questions. It’s not possible to practice 101 possible questions. Practice a few common questions until you feel comfortable answering them but, don’t practice reciting them word for word. Instead of memorizing dozens of answers, prepare a bank of information you can tailor for several different questions. Example: Practice telling a story of a time you excelled as a leader. Then, be prepared to use that story to answer questions such as: What is your number one strength? Or Tell me about a time you work as part of a team? Or What qualities can you bring to this department? Make sure you’re answers are sounding natural and not robotic. Try recording yourself for a more accurate evaluation. MYTH #2: The interview board will ask specific questions to get all the information they want. You need to identify what information, stories, and character traits best sell you for the position and be prepared to share them. A helpful way to do this is by creating your ideal interview. Write down five questions you wish the interview board would ask you. Think of questions that allow you to easily share your most significant achievements and highlight your top qualities. Then, write down your answers. This is likely the information you need to figure out how to share. Now add a few random questions to the mix and try to include the bank of information you just came up with in your answers. MYTH #3: Your answers are the most significant and most important factor in your interview. We talked about the impact your nonverbal cues and reputation have on your interview. Take the time to watch this video from Amy Cuddy, then work on your body language. Now is also an excellent time to make sure your social media accounts will earn their respect. MYTH #4: The interview board will hire the candidate with the most skills and experience. Remember, everyone has life experience. It may not be pulling hose, but I guarantee you have team experience, leadership experience, physical fitness experience, problem-solving experience. The list goes on. Research your department and know precisely what types of experience they value most. And never doubt your ability to get hired based solely on fire experience. MYTH #5: The interview panel holds all of the power and therefore dictates what you’re able to share. Our tip here aligns closely with myth #2. Identify what your interview needs to know and tailor your answers to include it. If you pay attention to interviews on the nightly news, you’ll notice that any experienced interviewee already knows what they want to say. They will push their agenda regardless of what questions the host asks. This isn’t done by changing the subject rather, by carefully constructing your answers to both answer the question AND include the information you’ve already determined is a priority. As we said before doing this right takes training and practice. That is exactly why we’ve created the Firefighter Interview Training Course. We realized that it isn’t always the best candidates that get hired but instead the candidates that interview the best. We don’t want you to get passed up (even though you’re the best person for the job) because you didn’t know how to execute an interview. The firefighter interview course is a self-paced online course that teaches you exactly how to confidently and persuasively navigate your interview. Learn more here. P.S. The process is proven. Here is what a few other students had to say. MYTH #1: It’s best to memorize your answers to common questions. 1. Once you sway slightly from your rehearsed answer you start to stubble while you try and get back on track. 2. When questions differ (and they will) from what you anticipated you get caught off guard. Instead, you must have a bank of information prepared and be able to apply it to any question they ask. The TopScoreinterview system teaches you how to build this bank of information and use it properly. MYTH #2: The interview board will ask questions to get all the information they want. In most cases, all candidates are asked the same questions. Meaning the questions are not uniquely formulated based on your history and skills. Regardless, the interview board is relying on your answers to uncover who you are, your work ethic, your character, etc. The board expects the questions to be a starting point; from there you need to dig deep and share your top qualities. We call these your Marketing Priorities. In the next post we’ll share a quick exercise you can do to make sure you’re up for the challenge. Your answers are critical; however, if your posture, the tone of your voice, eye contact, and reputation don’t earn their trust, then it doesn’t matter how good your answers are, you won’t get the job. You must have your nonverbal signs dialed in. Do not neglect to practice these things. Candidates with zero experience get hired every day over candidates with years of experience simply because the board believes they will complement the department better. If you have past fire experience that’s great. You should highlight it but, don’t rely on it to get you the job. Many departments will require you to go through their training no matter what experience you have. In this case, they are confident in their ability to teach you what you need to know. It’s your job to convince them you are capable of learning it and will fit well with the culture of the department. Learn how to be the most convincing candidate here. If the department you’re interviewing for does not conduct an academy, then experience will be a more significant factor. You must study your department and understand their needs. This is not true. You should have a list of items (character qualities, experience, etc.) identified before your interview that you are committed to sharing regardless of what questions they ask. Taking your interview to this level is what will set you apart from your competition. But, it takes training and practice to do it right. In our next post we’ll address each myth again and provide a few tips about what to do instead. P.S. If you want a simple yet powerful system to ensure you’re ready for your interview we’ve got you covered. Learn more here. 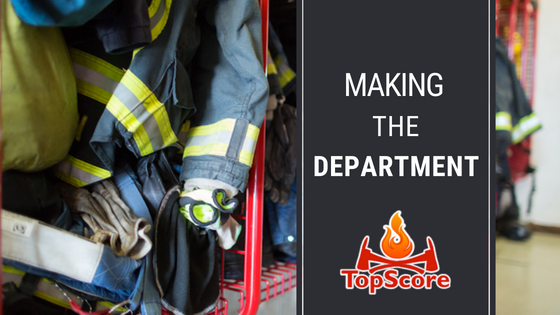 Rob Christensen, co-founder of TopScore and Interview Coach, spent three years as a wildland firefighter and 23 and counting with his current city department. With 26 years on the job, he's experienced the most horrific and rewarding of calls. Despite the many close calls he's witnessed and experienced, as well as, the scenes he will never be able to forget, he would choose this career path over and over again every time. In this audio, Rob shares his journey to a position with a city department; the lessons he learned, the obstacles he overcame and his advice for anyone currently in pursuit. Here's some incredible footage of a house fire he fought alongside his brother. The house collapses right before the 16 min mark. Don't' enter the biggest interview of your life blindsided. Take this quick survey and find out if you're ready for your firefighter interview. 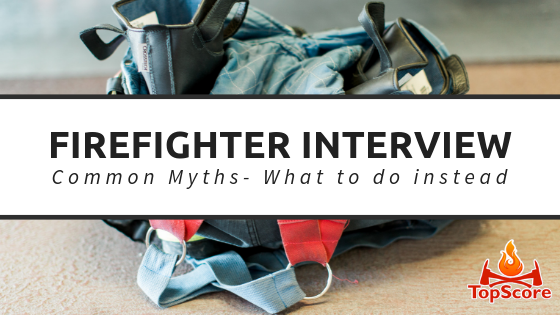 In this interview, Stephen gets into detail about how he prepared, his biggest take-a-ways from interview coaching, and his top tips for anyone seeking to become a firefighter. Is becoming a firefighter your dream job? We discuss methods to overcome past mistakes and ace the competitive firefighter interview process. Recent research shows that 92% of recruiters use social avenues to find quality hires, and 87% are using LinkedIn. With this in mind, staying up to date with your LinkedIn profile can not only keep you prepared if you need to find a new job, but it also leaves you open to other opportunities you may not have been aware of.